Well it’s safe to say I found my copy of the book, and as I had the day off on Monday due to my tootling up and down the country during the weekend I thought I would get on and read my copy of The Five Find-Outers and Dog; The Mystery of the Disappearing Cat. First of all I had to find the book, I knew it was somewhere, but as I have three possible places for Blyton books, I was going to have to search. Let’s just say by a stroke of luck it was in the second place I looked. Thank gosh it wasn’t the third otherwise I would have been ‘most put out’. Now my first thoughts when I sat down to read this I couldn’t help thinking what a wishy-washy title it was, it doesn’t sound exciting at all and I hate to say it, I was right. What a let down! Fiona thinks this is weird but if the book is well written but I don’t like the story, I will still read it, and in good time. Now with the Disappearing Cat, the writing is Blyton at her best, the words carry you along and you want to gobble up the story but the actual plot is disappointing. From the off I could have told you who the crook was, and that Goon was being an idjit and couldn’t see beyond his hatred for the children and their friend Luke. I know no one likes Goon, you’re not supposed to, but why isn’t he disciplined better- he shouldn’t be so dismissive of members of the public and disparaging of the children. If he behaved more like Inspector Jenks then he would get further in his inquiries. I have a hunch it is to show the difference between the educated and uneducated, Goon being the latter and Jenks the former. You know what – I could go on the clear differences of class for the whole blog if I could, I mean it’s very obvious and even more so in the Find-Outers books than some of the others, I think. If you think about it the fact that the children are smarter than the police constable it’s quite a giveaway. However I should actually go over the story for you. As with all good adventures it is almost the holidays and Bets is excited for her brother Pip to come home from school, as well as the arrival of Larry, Daisy and Fatty. She has been interested in the young boy next door, who is older than all the find outers, but still a child really. Luke is his name as I’ve mentioned before and he is the gardener’s boy for Mr Tupping who is employed by Lady Candling. Lady Candling is a collector of Siamese cats and has some that make a lot of money in shows. Her most prized is a cat called Dark Queen who can be identified by having a ring of white fur around her tail where another cat bit her and thus is immediately recognisable. It is Dark Queen as you can guess who goes missing, not once but twice. Now the way the cat ‘disappears’ under the gardener’s boy’s nose is remarkable, both times, and the children are ingenious at trying to work out how it occurred. Fittingly through all the teasing she endures Bets is the one who finds the main ‘glues’ and helps wrap up the mystery wonderfully well. She notices the smell of turpentine, and that its on a cat that isn’t Dark Queen. Fatty of course puts it all together before anyone else, and seems to be edging out as the natural leader in this book, even though Larry tries to pull rank by reminding Fatty that he is the oldest. The dynamic of the children has changed from the first book, Fatty is no longer the big outsider, but a settled member of the group now. He is still occasionally boastful and the others tell him to shush, but its not as forceful as before, and as I mentioned he is beginning to take the lead away from Larry. Speaking of Larry, and naturally Daisy, they don’t seem to have much to do with this adventure it is mostly down to Pip, Bets and Fatty – not forgetting Buster – solve a lot of this mystery without the Daykins having much input. As someone said in the comments of the Monday post, it doesn’t appear to have a lot of atmosphere, and I have to agree with Chrissie, this is a very flat mystery. It’s all done in back gardens and feels much younger than I suppose it is. Given the age for the target audience is the same as the Famous Five, the Disappearing Cat seems woefully under developed. Still a good read and I suppose it has decent character development, but the plot is thin, I hope the Mystery of the Secret Room is a stronger story, because its unusal for a series of Blyton’s to lose its spark so quickly. Anyway, let me know what you think in the comments! 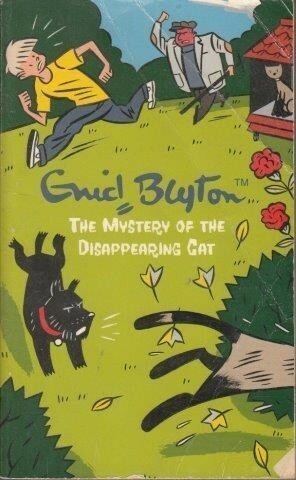 Do you like the Disappearing Cat? Am I totally wrong? Let me know! This entry was posted in Book reviews and tagged The Five Find-Outers, The Mystery of the Disappearing Cat. Bookmark the permalink. I much prefer this to Secret Room. People rave about that one but I wouldn’t rate it within a top 10 of FFOs. Yes Disappearing Cat is very ‘safe’ and local, but it’s only their second mystery and they haven’t yet gotten into their full stride yet. P.S. If that’s the edition you read, no wonder you came away with a less than favourable opinion. Well, I already thought that I was the only EBS forumite who doesn’t care for “Siamese Cat”. Read my old copy from the 1950’s more than once, but it’s just not up to par with the other FFO & Dog sequels. I reread “Secret Room”, “Hidden House” and “Tally Ho” countless times and think those are among the best in this series. Plus the one where Fatty keeps running/jogging along the river which is often hilarious (Missing Man?). Wow! I’m not the only fan of “Hidden House” :)! I must admit that I love the location in the woods. It does a lot for my imagination whenever I reread this book. Most of the FFO & Dog books (with the exception of the one with Christmas Hill) take place in downtown Peterswood, so I thought “Hidden House” was quite refreshing for a change. Amazing how opinions differ on these books – I am just starting and love reading your assessments, Stef.